“That’s mine!” Sophie heard her daughter scream at her younger sibling from the next room. As Sophie turned her attention to the unfolding scene, she saw her upset child swipe a doll out of the hands of her sister and hit her across the shoulder. What should Sophie do next? Young children, as they begin the negotiations of playing with others, particularly in preschool and kindergarten, get angry and frustrated but are unsure how to manage their feelings. It’s common for children to lash out or run away or melt down in a puddle of angry tears. In addition to not knowing how to handle their big feelings, the upset can be compounded by the fact that they do not yet have the emotional vocabulary at the ready to clearly articulate what they are experiencing. In considering how to teach young children how to manage anger, it helps to combat some myths or misperceptions about this sometimes feared, and often avoided emotion. bad or negative and avoid or shut down the experience of it. There’s good reason for it. We have all experienced someone(s) in our lives who has lost control and acted in ways that harm themselves or others when angry. However, we know that every emotion, including anger, serves a critical purpose. It provides information about who we are, what emotional or physical needs are not getting met, and where our boundaries lie. expressing anger such as yelling will dissipate it. In fact, research confirms that the expression of aggression whether it’s yelling or hitting (and that includes for parents, spanking) exacerbates the anger.1 Our bodies produce a surge of energy through hormones when angry that gives us a jolt if we need to run from a tiger or fight an attacker. When we yell or hit, more of those hormones are produced so that instead of a single jolt, our bodies refill with more angry energy. venting such as complaining, ranting or even mumbling gets out the upset thoughts and feelings. In fact, venting is to anger as rumination is to worry. We can churn through worrying thoughts in our minds repeatedly but those thoughts go nowhere and ultimately, are unproductive. So too venting, whether we are listing off our complaints to another or talking to ourselves, tends to reinforce our negative thinking. That’s because it does not offer an alternative view of the situation nor does it pose any solutions. Because venting doesn’t change thinking, the feeling persists. avoiding or pretending you are not angry will make it go away. Because the emotion – like any other emotion – is emerging to send a vital message to its owner, it cannot be avoided or denied. When turned inward, that anger can become destructive in the body. Also, when anger is buried, it can be stuffed down for a time but may contribute to a larger explosion (that may not have occurred otherwise) because of the build-up of heated emotions over time. Your young child is learning to respond to her emotions primarily by watching how you respond to your own emotions. Because modeling is her first teacher, there are a few steps you can take to deal with your own anger. By adopting these practices, you can feel confident that you are simultaneously teaching your children how to deal with their own upset. This self-awareness can come from a number of cues. First, notice – how does your body typically react when you are mad? Do your ears turn red and hot? Do your hands shake? Does your heart beat rapidly? Those physical symptoms – different in every person – can cue you to the need to calm down before choosing your next words or actions. Are you raising or lowering your voice volume? Notice the signs and take the following steps. Slowing down your breathing serves a critical biological function. It allows those hormones that have surged from your anger to recede. Your body is able to regain its composure. And your brain is able to think beyond fight, flight or freeze. Practice deep breathing audibly. If you’ve practiced yoga, try using ujjayi breathing (or “ocean breath”) in which you breathe deeply through your nose while constricting your throat slightly producing a sound like the waves of the sea. Not only will the sound help calm you, but it will also emphasize and call attention to your breath for your young child to observe. Switch into slow motion. Use the burst of energy to become extremely slow and intentional about using your body. Drop down to the floor or in a chair. Close your eyes. Breath and go within to regain your calm. No matter what chaos is happening around you, you can be assured that you will accomplish nothing – except perhaps to make matters more contentious – by reacting in an angry moment. To learn more, check out the article. Yes, the fresh air does help you breath better and the natural surroundings are instantly calming. If you cannot get away, just walk into your yard and pace around your patch of grass. Look up in the trees. A few moments can help restore your grounding. Research has found that distraction really does work to calm rage. Books, television, or movies can help. That’s because they focus your mind on a differing perspective and remove the thoughts that are feeding the anger. But be careful not to rely on this as your only strategy since it can serve as an avoidance mechanism too. If you use distraction, then after you’ve calmed down, use the next step – writing – or talking with a confidante to reframe your thinking to understand what you can learn from your current challenge. Writing down your angry thoughts (versus ruminating in your head about them) can offer you a chance to re-evaluate your situation. You can reframe it, look at it from another perspective or search for the silver lining. When you reflect in your writing on what you can learn from the situation, it has a calming effect. Emotions are helpful signs from ourselves that we need to pay attention to our needs. We know when we are feeling angry when we feel the signs in our body. Find out what your child’s signs tend to be. Using feelings words helps us feel better and helps others understand us. Move to privacy and safety. So often, our children melt down in the least convenient places. 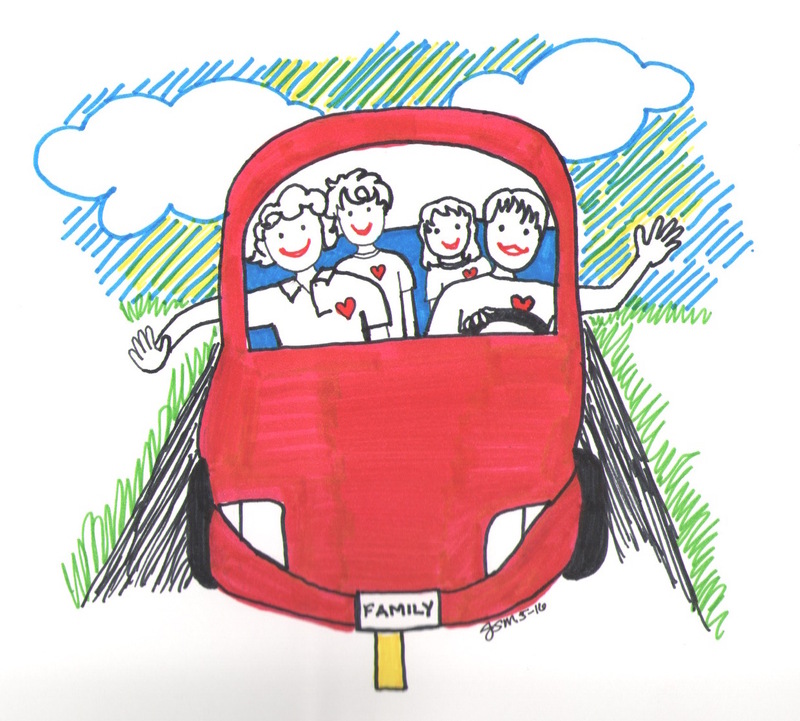 Whether it’s at the grocery store or in the preschool parking lot, we are often in the midst of moving through our daily routine in public and not at home. That’s why this first step is important. Young children are becoming increasingly aware of peers and the perceptions of people around them. Though they may lose emotional control, their upset may grow more intense as they feel embarrassed they are “losing it” around friends, teachers or strangers. So practice joining hands and moving to a safe, private space closest to where you are. You never want to have to drag a child or force them to move. For that reason, this practice is essential. You could position yourself in various places during your game and say, “Where can we go to be safe and alone?” When you are at the store or at a restaurant (any usual place your family frequents), try it out when all are calm and make it a part of the game. 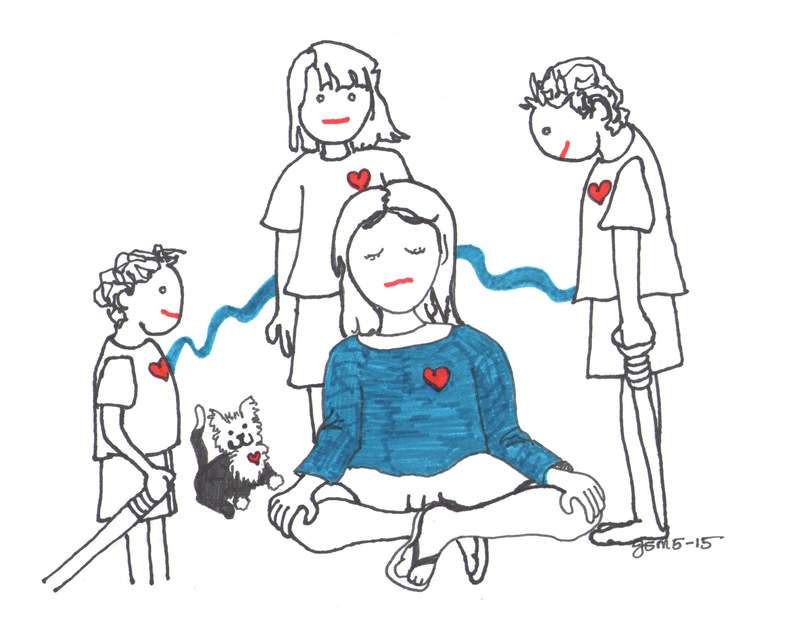 There are numerous ways you can teach your child to deeply breathe. 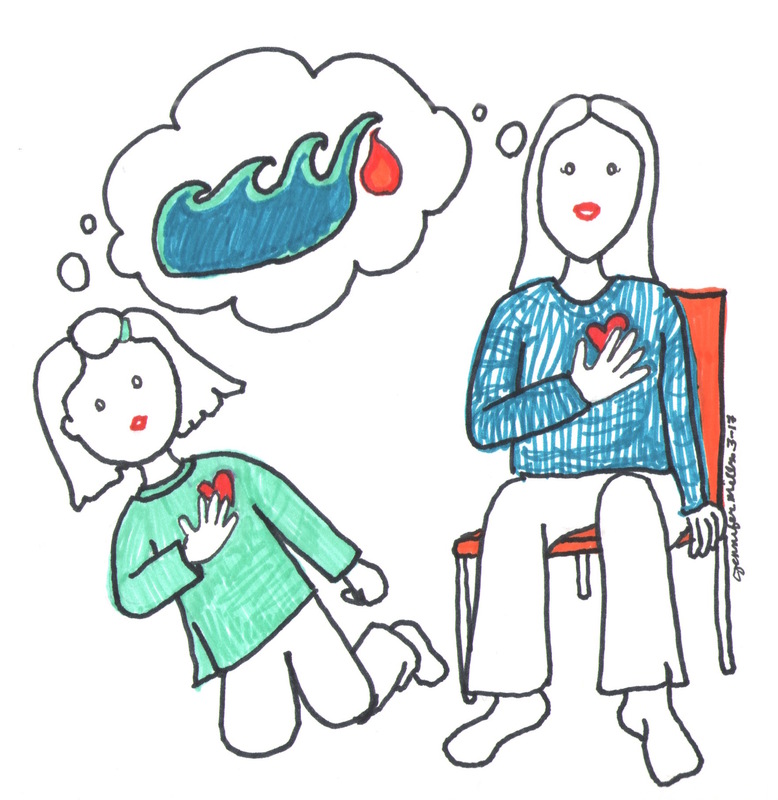 You could begin by simply placing your hand on your own heart feeling it beat and encouraging your child to do the same. Now run in place a few minutes and feel again as it beats more quickly. Explain that you’ll have a faster heartbeat when you’re upset. But as you practice any one of these breathing games, your heartbeat will slow down again. Here are a few methods. Pretend to hold your hot cup of cocoa in both hands in front of you. Breathe in deeply the aroma of the chocolate. And then blow out to cool it in preparation for drinking. Do this to the count of five to give your child practice. Then, look for chances to practice it regularly. breath. Great idea! This would be ideal to practice during your bedtime routine when you are lying down and wanting to calm down for the evening. You can pretend you are blowing out candles on a birthday cake. Just the image in your head of a birthday cake brings about happy thoughts. And in order to blow out a number of small flames, you have to take in deep breaths. This is one you can try anywhere, anytime. Practice making the noise of the sea waves while breathing deeply from your diaphragm. Close your eyes with your child and imagine that your anger is a fiery flame waiting on a sandy shore. And as you breathe life into the ocean waves, they grow closer and closer to the flame to extinguish it. In the research-based social and emotional learning curriculum for schools, the PATHS (Promoting Alternative Thinking Strategies) curriculum encourages children to pretend they are a turtle. When they are upset, they can sink back into their shells (they can place their arms over their head) and breath inside the shelter of their own arms to regain calm before reentering their environment. This could inspire wonderful play with young children and stir their vivid imagination of what it might look like and feel like when they are calming down. 3. Distract, Reflect and/or Reframe. There may be times when distraction works better than other times. Guiding a child to sit with an engaging picture book, an activity book or a puzzle can be a way to distract from the upset of the moment. Drawing or writing can also serve as calming activities. 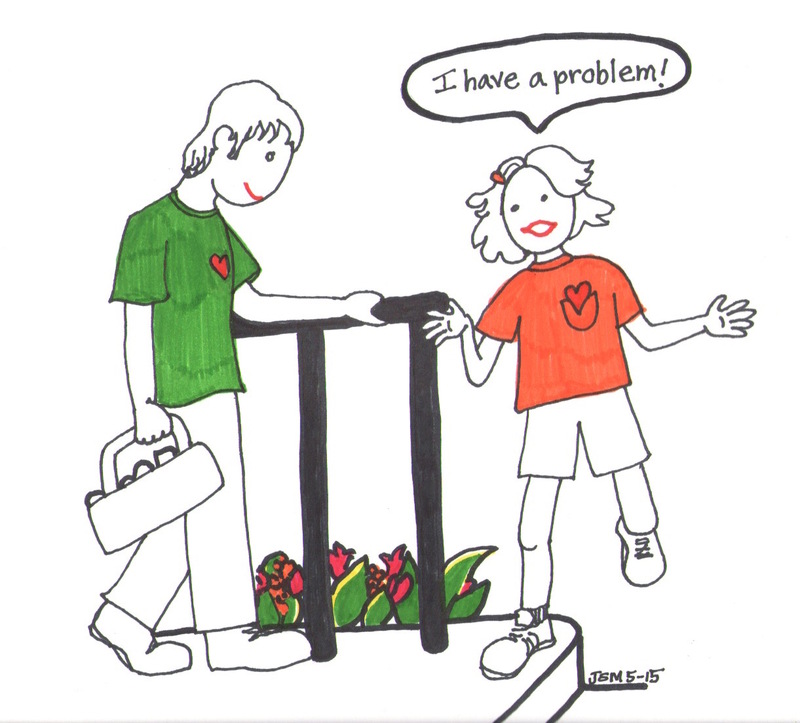 But if your child has shown big feelings – anger, frustration, sadness, anxiety – be sure that you return to discuss it. Ask what she’s feeling and name it. “It seemed like you were frustrated. Is that right?” That will offer her the chance to identify and articulate her feelings. Find out why she was feeling upset. Offer some alternative perspectives and help her reframe her own thoughts to see a bigger picture if possible. This is the time to brainstorm other ways to handle a problem situation. Could she and her sister set a timer and take turns playing with the doll, for example? 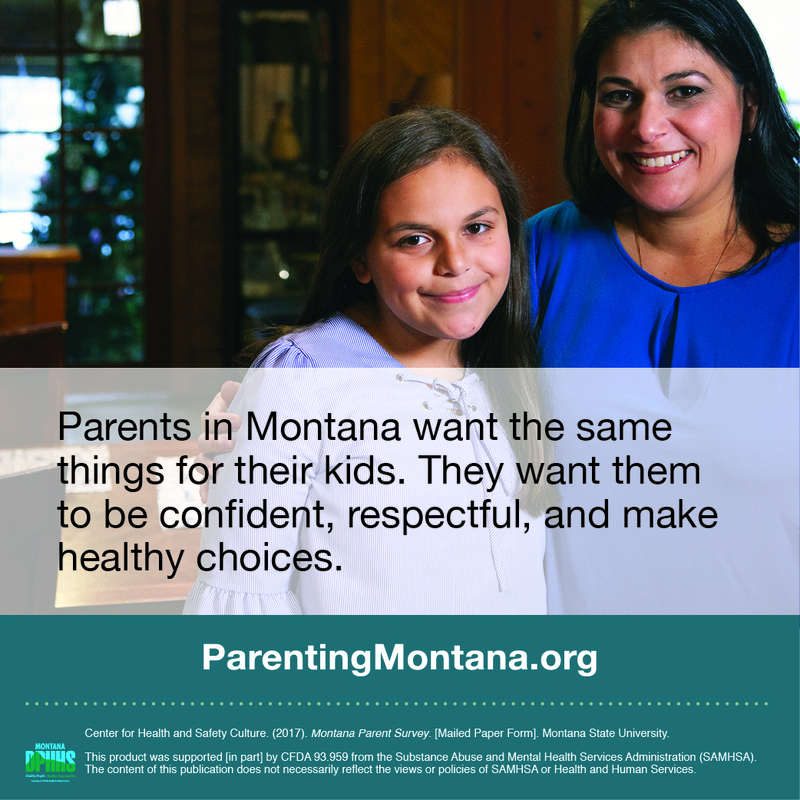 Challenge yourself to find and offer a compassionate perspective whether that means guiding your child to think empathetically about other children in the situation or to seek self-compassion for her situation. When you are practicing this particular step, have your child use a stuffed friend to reflect on the situation. Ask her to tell her bear what happened, what she was feeling, what she was thinking and how she might help her bear feel better. This is also the time to brainstorm other ways to handle a problem situation. Could she and her sister set a timer and take turns playing with the doll, for example? 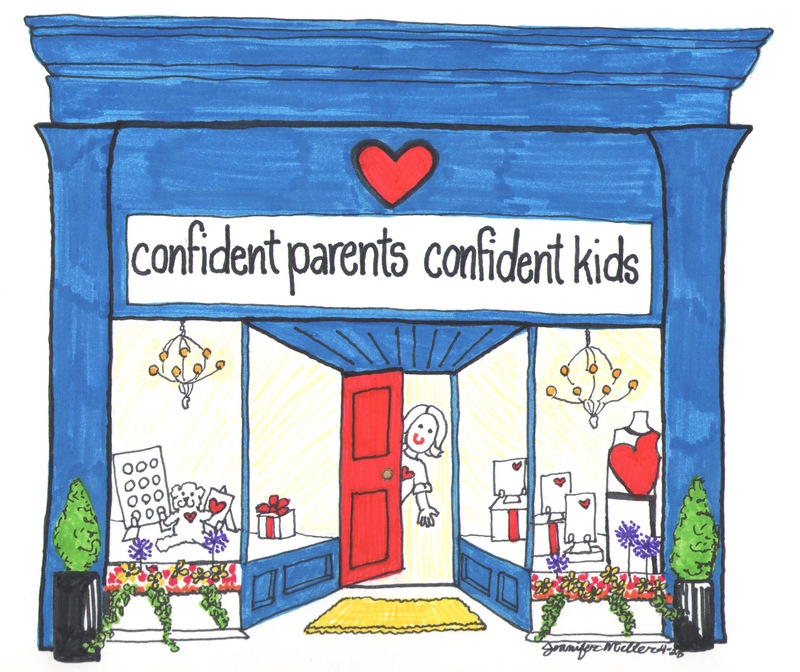 Challenge yourself to find and offer a compassionate perspective whether that means guiding your child to think empathetically about other children in the situation or to help her find self-compassion for her situation. When you are practicing this particular step, have your child use a stuffed friend to reflect on the situation. Ask her to tell her bear what happened, what she was feeling, what she was thinking and how she might help her bear feel better. Anger can challenge any of us to act with the emotional intelligence we ideally want to possess. The trick is becoming aware, stopping the escalation and calming down before we have fully lost our sensibilities. The hope and opportunity (and also, the challenge) is that our young children are watching and learning. 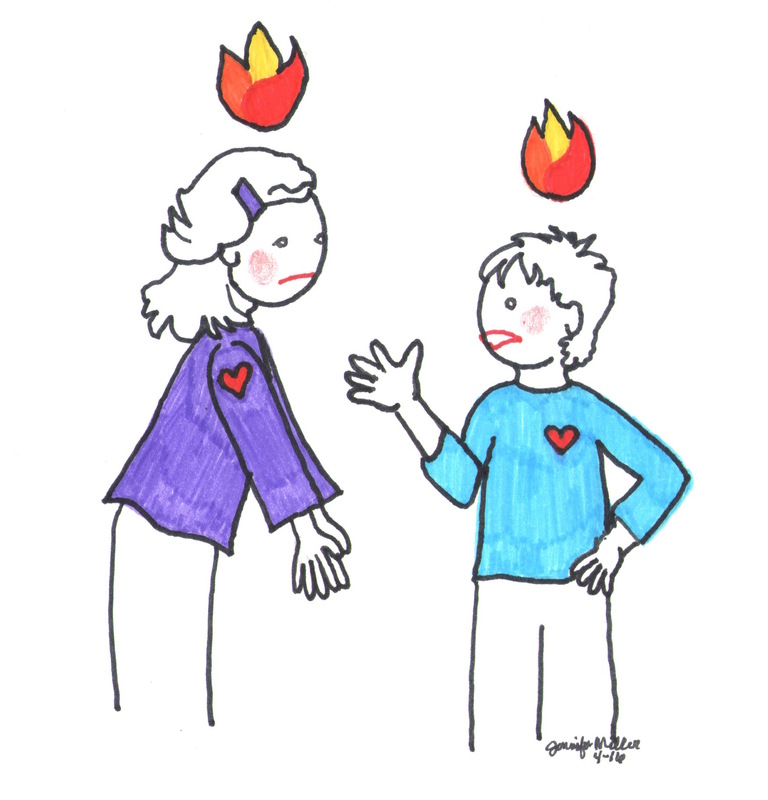 If we avoid the chance to get angry and deal with it, then we lose the chance to show our children what it looks like to regulate our emotions. If we practice, plan and remind ourselves about the ways in which we’ll act and how we’ll calm down, we’ll be prepared to model an essential life skill and know we can face our greatest parenting challenges with a plan at the ready. *Thank you, collaborator, R. Keeth Matheny, co-author of School Connect, a research-based high school social and emotional learning curriculum, for raising this issue. Lerner, H. (2014). The dance of anger; A woman’s guide to changing the patterns of intimate relationships. NY: Harper and Row. Goleman, D. (1995). Emotional intelligence; Why it can matter more than IQ. NY: Bantam Books. Pingback: Understanding Your Child’s Anger | We Were Meant to be Teachers!